It’s a feeling anyone who has grown up on a farm knows well: the excruciating helplessness of looking out over your parched veld or crops and watching rain fall from heavy clouds in the distance, on another family’s farm. Almost as painful is the hopelessness you are left with after hearing the rumble of thunder, and seeing clouds gather over your farm, only for them to be blown away before they could release a single drop of water. 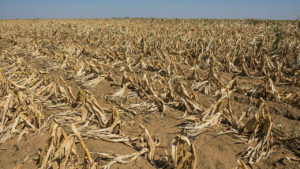 I wish I knew exactly what to say to encourage those farmers in South Africa who are facing a third consecutive failed harvest, who have had to choose which of their crops they will save, and which they will have to watch wither away, and those who have no idea where the feed, or the money to feed their animals, will come from this year. When I think back to my childhood spent on my parents’ KZN farm, my memories of rain are mostly happy. Rain meant that we would get pancakes for lunch; thunder meant we would be without electricity and a phone for at least 24 hours or even longer. Rain would also be accompanied by a feeling of peace and stillness.